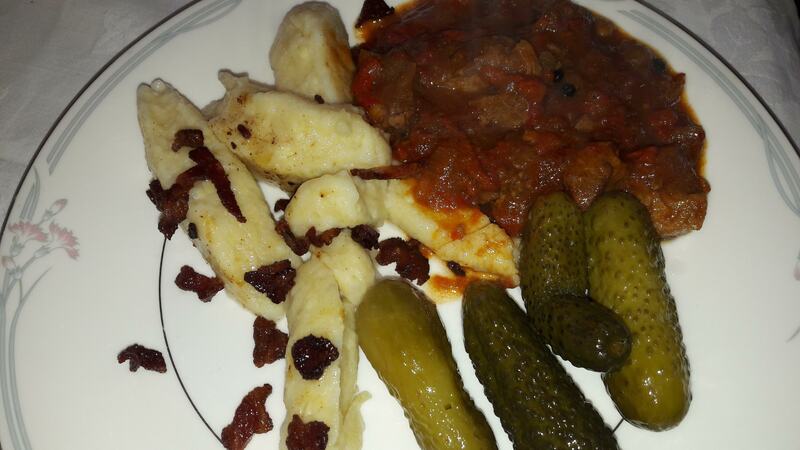 I wrote about kopytka – Polish potato dumplings a good while back. Since then I have tried another version which uses cheese as well as potatoes. 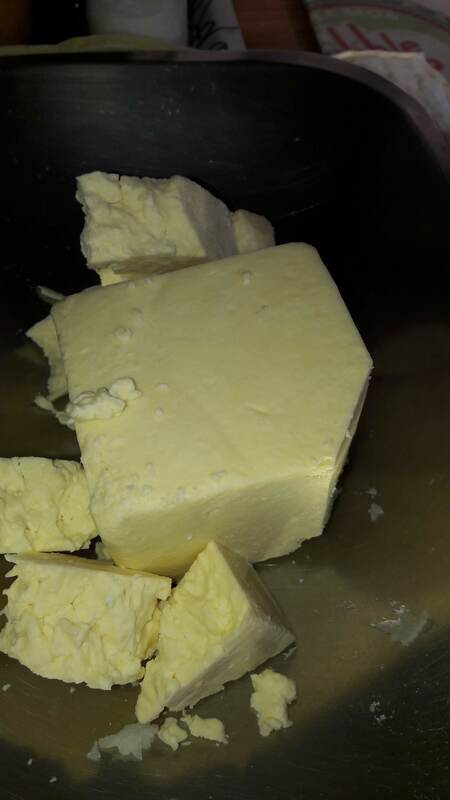 Traditional recipes use twaróg – Polish curd cheese – I have found that crumbly, white, mild, English cheeses such as: Cheshire, Lancashire or Wensleydale are also good. 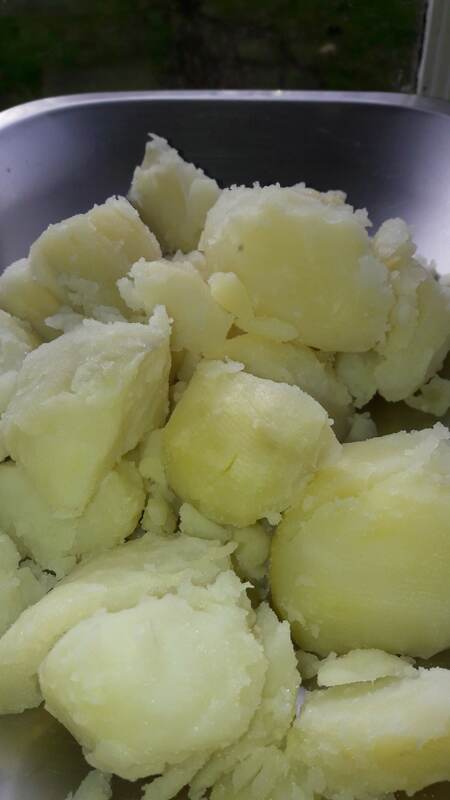 Whilst looking at many recipes, I saw that the proportions of boiled potatoes to cheese varied greatly. I have gone for roughly equal weights of boiled starchy potatoes to cheese. 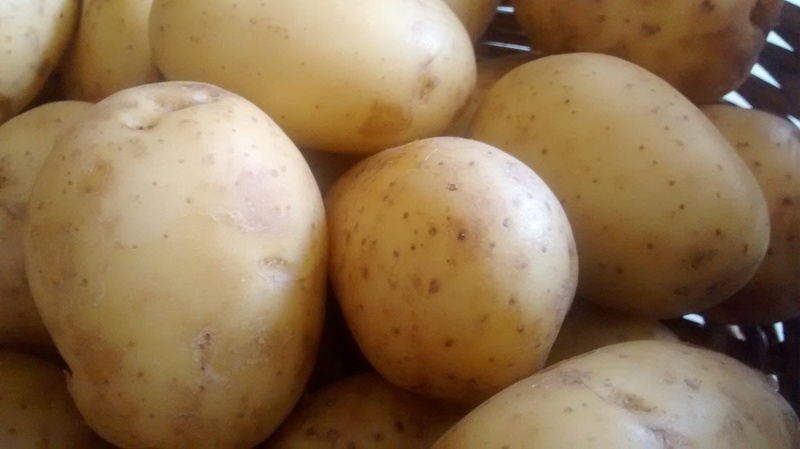 The exact amounts are not critical but you must use starchy potatoes such as King Edward or Maris Piper. 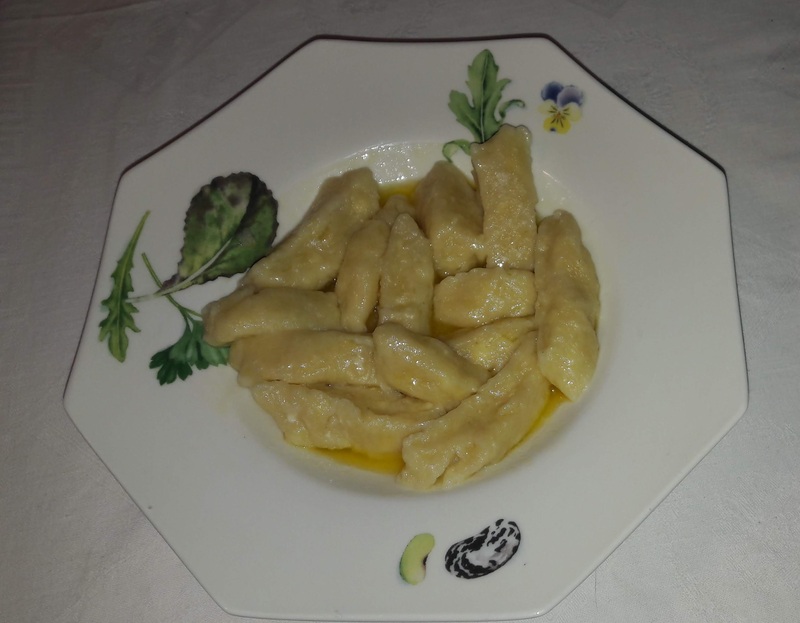 Serve with either melted butter, à la Polonaise (buttered breadcrumbs) or skwarki (crisp, fried, small squares of bacon) or a hot sauce such as mushroom. 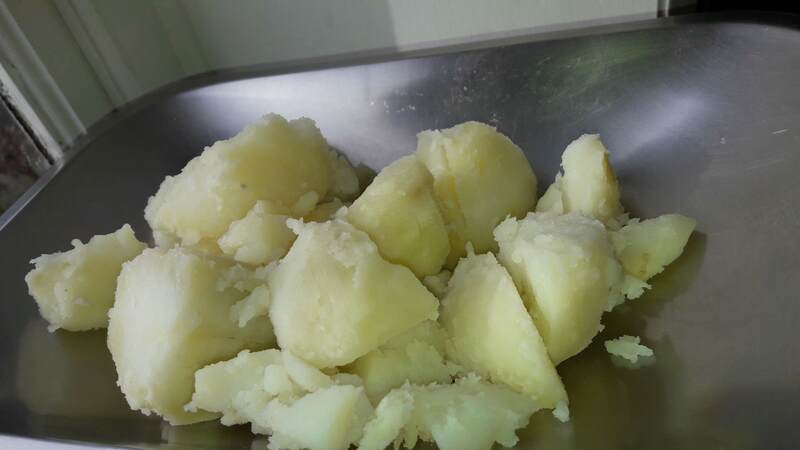 Use a large bowl and put the cold boiled potatoes into the bowl. Crumble the cheese and add it to the potatoes and mash them both together. Add the yolks to the mixture. Weigh out the flour to give an idea of how much is needed; this will depend on the type of potato and the size of the eggs. Add the flour and mix first with a wooden spoon and then by hand, you might not need all the flour or you may need more. Mix until you have a soft dough. Divide the dough into quarters and using a floured board shape the dough and roll it with you hands until you have a long sausage about 3cm in diameter. If the dough sticks to the board then you need to add more flour. 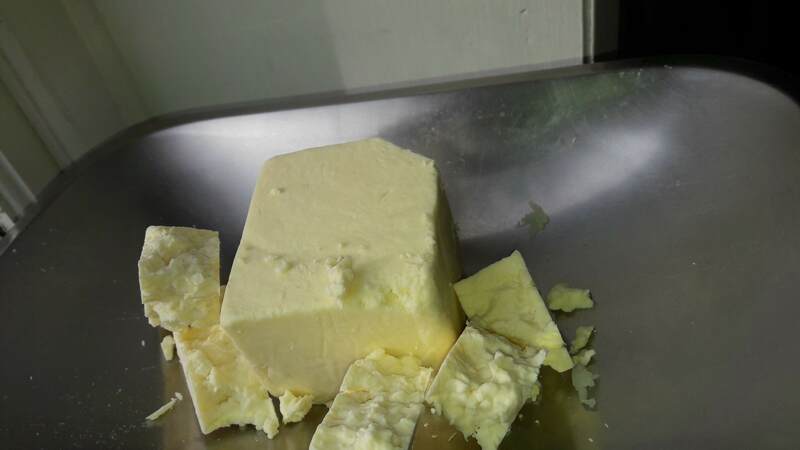 Use a sharp knife to cut the dough into pieces, make the first cut at a diagonal and make the thickness about 1 to 1.5cm. You will get a sort of oval shape. Repeat this with the rest of the dough. Fill a large pan with water, add some salt and bring this to the boil. 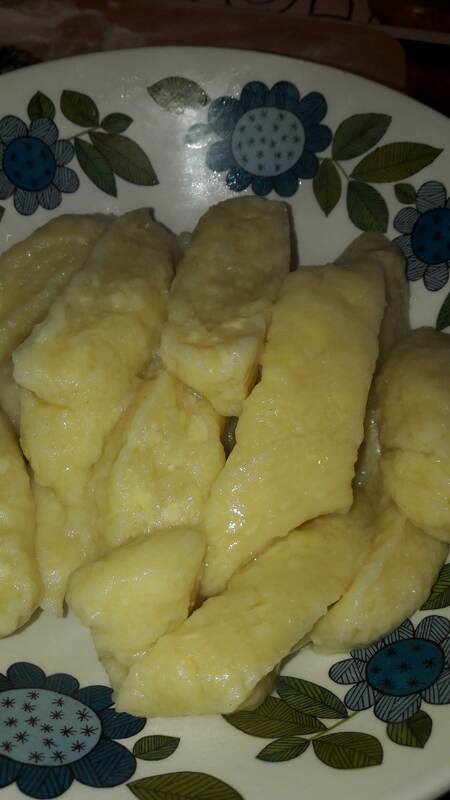 When the water is boiling, add the dumplings one by one, do not over fill the pan or they will stick together. I tend to do this in 4 batches. 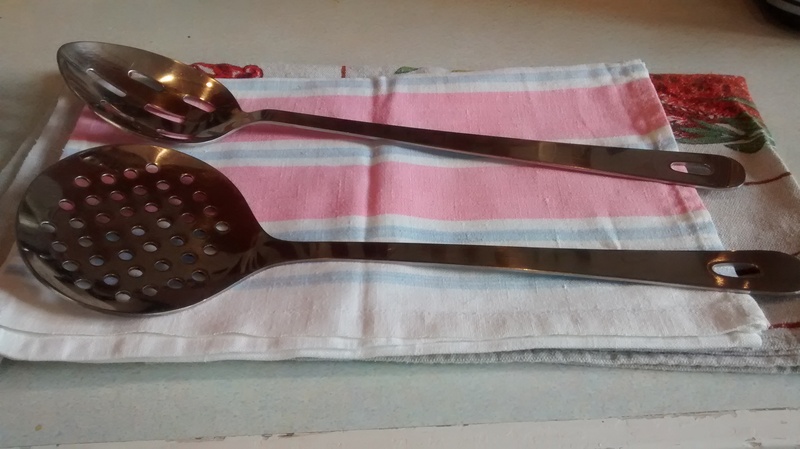 As they cook they will float to the surface, give them about another minute and then remove them with a slotted or a perforated spoon and put them in a colander. I have a colander sitting in an empty pan by the side of the large pan in which I am boiling the dumplings. I find that the maximum from putting them into the water to taking them out will be 3 minutes, if you cook these too long they will start to fall apart. Wedgwood – Chelsea garden – early 21st century. 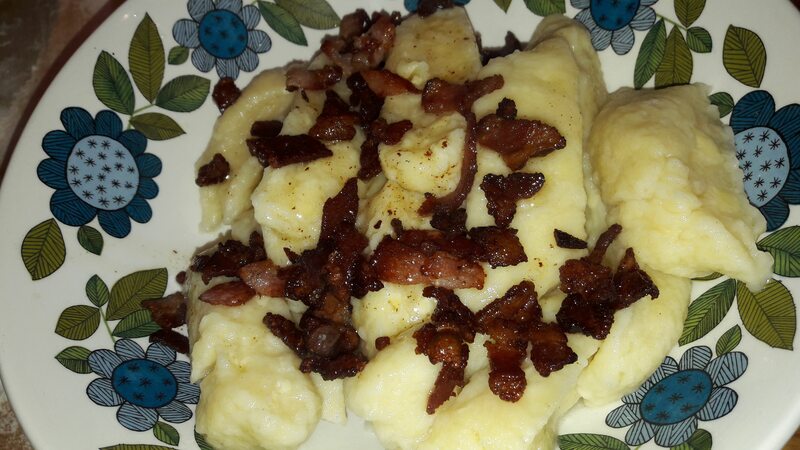 Here served as suggested above with melted butter, with skwarki (crisp, fried, small squares of bacon) and a gulasz.